Civilization VI turns an eye toward Southeast Asia for its next round of DLC, with Indonesia and Khmer both set to join the world stage. Indonesia will be represented by 14th century queen Dyah Gitarja, while the Khmer people, who today live in Cambodia and parts of Thailand and Vietnam, will be led by King Jayavarman VII. 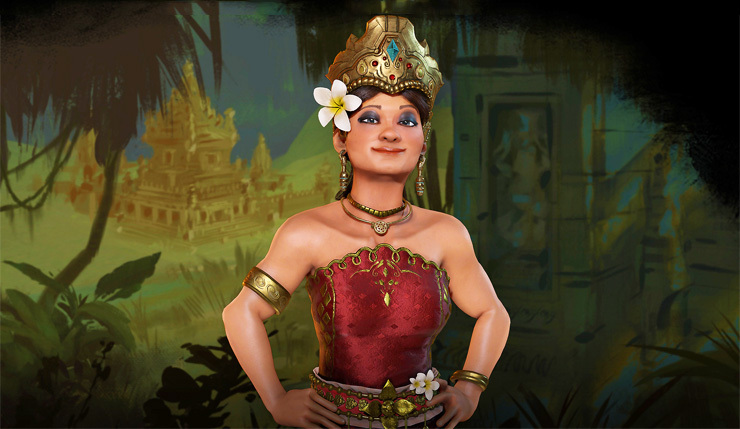 Indonesia first appeared in Civilization V, while Khmer has been a part of the series since Civilization IV. Dyah Gitarja went from being a princess locked in a tower to the warrior-queen regent of a 14th Century spice empire, the kingdom of Majapahit (located in modern day Indonesia). It all started with an assassination. With the help of Gajah Mada, a long-trusted advisor, she began a campaign to quell rebellions and push a massive expansion of the Majapahit Empire. Legend tells us that Gitarja even rode into battle alongside her cousin, Malay king Adityawarman. Ultimately, she is remembered for expanding the boundaries of her empire to include the kingdoms of Pejeng, Dalem, Debahulu and the island of Bali while helping stabilize the kingdom. Massive jong ships, the schooner of the Majapahit fleet, dominated the Southeast Asian seas. While primarily a merchant ship and military transport, jongs were built to withstand incoming cannon fire and return the favor with its own ordinance. And, with the addition of a second rudder, a 600-ton jong was fast, yet easy to control. “Nusantara” is a contemporary term for the Indonesian archipelago, but for some time had been credited to Gitarja’s advisor – Gajah Mada. In an oath known as Sumpah Palapa, he vowed not to eat any food containing spices until he had conquered all of Nusantara under the glory of Majapahit. As a coastal civilization, it only makes sense Indonesian Coastal Tiles provide adjacency bonuses for certain districts. Complexes give an extra Amenity if they are adjacent to a non-lake Coastal Tile. The Majapahit kingdom expanded on the strength of its naval might, buoyed by the spice trade and spreading the beliefs of the Buddhist-Hindu kingdom. The “Exalted Goddess of the Three Worlds” ability grants bonus Faith to coastal cities. This allows Gitarja to purchase Naval units with Faith at a discount, as well as eliminating movement cost for Religious unit to embark or disembark. Rising to power during a period of crisis for the Khmer, King Jayavarman VII was a military leader. By 1181, Jayavarman VII had repelled Cham invaders to the north and when hostilities died down, he crowned himself king. But instead of turning outward and seeking to aggressively expand, he focused on his people. King Jayavarman VII saw himself as a warrior for his subjects. As a result, his rule was marked by its tolerance and his drive to create a place of safety and paradise for his subjects. He went on to make Mahayana Buddhism the state religion, breaking with 400 years of Khmer Hinduism. And to mark the occasion, he would initiate an era of unprecedented construction and infrastructure creation. King Jayavarman VII and his people-driven reign remains fondly remembered in Cambodia, where he figured prominently in state-produced education materials well into the 20th century. Khmer employed war elephants in their military campaigns. Once docile farming animals, Domrey were 12,000 pounds of might used to break enemy lines and stampede through enemy forces. Usually, Khmer riders would use the precision of double crossbows to supplement the raw power of their elephants; however, the Domrey variant here adds the sheer force of a mounted ballista, making it more mobile (and more deadly) than a traditional catapult. These holy sites at the center of Khmer worship would serve as both symbols of their warrior-kings’ piety and their engineers’ brilliance. The earliest Khmer temple on record is Prasat Ak Yom (c. 800), its design reflecting the South Indian tradition of ‘ratha’-style temples, towering edifices terminating in a crown at the top. Of course, the Khmer would add their own flourish, adding prangs, or towers to the structures. With Jayavaraman VII’s pious devotion, it makes sense that his unique ability, “Monasteries of the King,” would highlight his religious reform. Playing as Jayavaraman VII, you can grab adjacent territory when you complete your Holy Sites, which also provide additional Food and Housing when built on a river. The “Grand Barays” ability focuses on Jayavaraman VII’s devotion to providing infrastructure to his people. This ability increases Khmer’s food yield when Farms are built next to Aqueducts, and makes Aqueducts far more versatile by granting bonuses to Faith and an Amenity. Looks like Indonesia is all about seafaring dominance, and should be a great choice if you’re playing on an island-heavy map. Khmer, on the other hand, seems like a good, balanced choice, with strong military, religious, and population-boosting abilities. I’m definitely excited to give Khmer a spin, as I like to focus on the city-building and religious aspects of Civilization VI. What about you? Do the new civs strike your fancy?